Gain access to and solve the mystery of the Pelagius Wing. Sheogorath tries to cheer up Pelagius the Mad over a feast. Investigate a man called Dervenin. Gain access to the Pelagius Wing of the Blue Palace. Search for Dervenin's master in the Pelagius Wing. While in Solitude, you may hear a rumor at the Inn about a mad beggar roaming the streets and ranting, or come across the beggar near the Bards College. Dervenin will be found walking in the streets, lamenting his missing master. Speak to him and he will complain that his master is neglecting his duties and that chaos will ensue. He says that his master is in the Pelagius Wing of the Blue Palace having tea with an old friend. He will tell you that you'll need "the hip bone" to enter, and give you Pelagius' Hip Bone. Enter the Blue Palace and locate one of the cleaning staff. The key can be obtained from Erdi or Una by discussing the Pelagius Wing with her and telling her that Falk asked you to "look into it". You must pass an easy level, invisible Speech check to persuade her to give you the key. Alternatively, you can convince the castle steward to let you in if you have completed the quest The Man Who Cried Wolf. If you lack the respective requirement, the final dialogue option will not appear; the NPC will simply exit dialogue. I need to get into the Pelagius Wing. Absolutely not. That wing has been sealed for hundreds of years, and for good reason. They say the ghost of Pelagius the Mad still haunts it. Ghost or not, there are reminders of his dark rule that are best left buried away. Not on your life. It's dangerous in there, and Falk doesn't even like me and Erdi going in every year to clean out the spiders. Oh, I'd get in trouble for that. It's not allowed. Besides, it's scary in there! Falk asked me to check it out. (Una and Erdi) I'll make an exception for you, but do not bring anything out when you leave. Too many dark deeds transpired in those halls... If you really want to... Just be careful of the ghost! He snuck up on me once and scared me sick. It took a week for me to feel better... Well... I suppose in that case, it's okay to let you in. But only briefly. Be careful, and come right back! Exploring briefly in the wing will show it in a state of disrepair. Further travel will require you to walk through some spider webs before you suddenly find yourself transported into a strange realm. You will find yourself suddenly wearing a full set of Fine Clothes with your inventory inaccessible and your abilities removed. The scene before you appears to be an extravagant dinner set in the middle of a misty wood and surrounded by stone archways. Two people are sitting at the table, one wearing a distinctive outfit and sitting on a throne, and the other a depressed man. The latter is Pelagius III who is complaining of various woes, although he sounds strangely sane, which delights the man across from him. Pelagius will leave after a short conversation during which the other man tries to cheer him up. The other man is actually Sheogorath himself. Tell him that you have a message for him and that he needs to come back from vacation. Sheogorath says he will leave if you can make your way out of Pelagius' mind. He will give you the Wabbajack to help you. There are three arches which lead to three separate trials, all of which must be completed. To the southeast is the Arch of Confidence, to the northeast is the Arch of Night Terrors and to the northwest is the Arch of Paranoia. These trials can be completed in any order. In this scene you will see Pelagius' Anger beating up Pelagius' Confidence. Confidence doesn't look like he is doing too well, since he is tiny and Anger is huge. Sheogorath wants you to tip the scales. 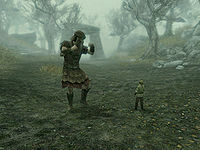 Use the Wabbajack on Anger until he is tiny, and then on Confidence until he is as big as Anger was. You must act quickly, as Confidence will shrink every time Anger hits him. During the battle, two spectral figures labeled Self Doubt will appear and begin to spar with each other. They do not seem to serve any purpose other than to get in your way as you attempt to complete the trial. A wolf will appear (to be turned rather humiliatingly into a goat). A bandit chief will then appear, to be turned into a younger version of Pelagius. A hagraven will appear. After use of the Wabbajack, it will be turned into one of Pelagius' sultry maidens, from his early days. A flame atronach will appear. It turns into a bonfire after use of the staff. After all of the terrors have been converted, everyone will convene around the bonfire, and Sheogorath will communicate with you and ask you to progress to the next area. Through the Arch of Paranoia to the northwest is a small fort-like structure with steps leading up to the edge. In the middle of this structure there is an arena occupied by two fighting Storm Atronachs. Supposedly, one is yours and one is your opponent's, who is sitting opposite you with two other men. You are instructed to use Wabbajack to defeat your enemy. Don't bother zapping the atronachs themselves, as one will respond to the changes the other goes through, making the fight endless. Instead, aim for one of the two bodyguards sitting next to your opponent and Wabbajack them. Both of the men will turn into wolves and attack your opponent, killing him. Go back to Sheogorath when you've finished his tasks and tell him you've fixed Pelagius' mind. 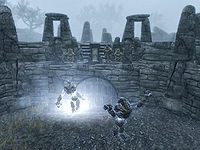 He will summon Dervenin and return to the Shivering Isles, telling you to keep Wabbajack. He mentions his chamberlain, Haskill, as he prepares to depart, saying, "Well, I suppose it's back to the Shivering Isles. The trouble Haskill can get into while I'm gone simply boggles the mind..." You will then be transported back to the Pelagius Wing with all the items and powers you had when you started, as well as your new staff and clothes. Before leaving, move further down the hall and down the stairs to find a copy of the Lockpicking skill book Surfeit of Thieves. This quest contains several references to events in Oblivion and the Shivering Isles expansion. See here for more information. The Items, Magic, Map, and Skills keys are disabled during the quest, but the Map can be opened by first going to Quest, then pressing M to show on map, then pressing L to show local. Consequently, it is also impossible to open the chest in the Night Terrors scene. The Favorites menu and hotkeys are also disabled. If you open the menu using the method above (or by pressing X on a highlighted quest, if playing Xbox360) you can fast travel out of Pelagius's mind. However, you will be unable to open menus, favorites, or change equipment. You will still be wearing the same outfit as in Pelagius's mind and be holding the Wabbajack. 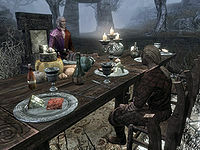 You cannot pickpocket Sheogorath or Pelagius the Mad, but you can pickpocket Pelagius' Confidence (once Pelagius' Anger is defeated) and Dervenin (once he is summoned). One of the atronachs may attack you before fading away. Right before you enter Pelagius' mind, you may appear naked for a brief moment. It is possible to access your inventory while in Pelagius' mind; at the Night Terrors scene after the wolf is turned into a goat, other terrors can kill it. Its body can be "looted", rendering you able to take off your current equipment. This quest can be done as early as level 1. If your Speech skill is too low to convince the maids to let you into the Pelagius Wing, you can increase the skill with Fortify Persuasion effects. 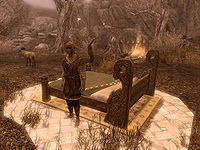 You can get The Gift of Charity bonus from Dervenin by giving him 1 gold before asking him about anything else, and you can get the Blessing of Dibella from the Temple of the Divines in Solitude. If you enter Pelagius's Mind while you have the Stray Dog in your company, the dog won't be in the Wing when you return—other followers such as Lydia (human) or Barbas (dog) are unaffected. The game may freeze on transition into Pelagius's Mind. This is probably just a "normal" transition freeze, but it may be caused by the quest-specific behavior that occurs at this point, and may not allow you to continue with the game. It is possible the freeze is caused by having more than 999 items of one kind - likely to be one or more types of arrows - in which case the freeze can be avoided by dumping enough of the offending item(s) to reduce the count to 999 or less, before reaching the transition point to Pelagius's Mind. Pelagius's Mind is technically an outdoor area and can spawn dragons. When you complete all the tasks for Sheogorath, he will bid you farewell but you will not actually leave Pelagius' mind. Loading from an earlier save usually fixes this. If you have a Dead Thrall active when you enter Pelagius' Mind, the thrall may be missing when you return. If this happens, check your active effects, and if the thrall is still assigned to you, fast travel may return it to your location. ? 10 Dervenin wants me to talk to his master about returning from vacation. To do so, I need to gain entrance to the Pelagius Wing of the Blue palace. 50 Dervenin wants me to talk to his master about returning from vacation. His master should be somewhere in the Pelagius Wing of the Blue Palace. 100 Dervenin wants his master Sheogorath to return from vacation. I have tracked Sheogorath and been transported by him in to Pelagius's mind. If I can find a way to home Sheogorath has promised to return home as well. 200 Finishes quest I have helped Dervenin by convincing his master Sheogorath to return from vacation inside the mind of Pelagius. Sheogorath has rewarded me with the Wabbajack for my troubles. The following empty quest stages were omitted from the table: 0, 20, 30, 40, 55, 90, 95, 150, 190. On the PC, it is possible to use the console to advance through the quest by entering setstage DA15 stage, where stage is the number of the stage you wish to complete. It is not possible to un-complete (i.e. go back) quest stages, but it is possible to clear all stages of the quest using resetquest DA15. This page was last modified on 2 April 2019, at 14:37.